Bolton 21 vs. 18 Northwich - 26 April 2014 - 1st XV - Bolton R.U.F.C. A last gasp try from Rick Newman secured the win for Bolton and sparked jubilation in the Bolton camp as the Cherry & Whites rounded off their incredible season in a nail-biting play off game. Bolton kicked off into the win and with a 250+ strong home support cheering them on from the side lines. Northwich to their credit had an equally strong travelling support making for an incredible atmosphere down at Avenue Street. From the kick Northwich began to test the Bolton defence with their back row particularly prominent in the loose. However, Bolton showed why they have remained unbeaten at home since October 2012 with an incredible defensive effort. Bolton's first opportunity to take the lead came on 10 minutes when an offence at the breakdown gave Mark Doherty the opportunity for 3 points. Unfortunately the chance was missed but Bolton were starting to feel like they had the momentum and were keeping Northwich pinned in their own half. The pack were getting on top in the scrum driving their larger counterparts back with regularity. This was giving Singleton and Mills good ball to work with in the backs who started to bring Dave Bruen and Will Bate into the game. However it was the forwards that took the credit when Rick Newman crashed over from close range for the opening score of the game following a strong driving maul at the back of the line out. Doherty made up for his earlier miss with the conversion and Bolton were 7-0 up. Despite both teams continuing to pressure their opposition the defences held strong with Tony McLaughlin, Chris Mee and Alex Youngman putting in their usual dogged displays in the tight. 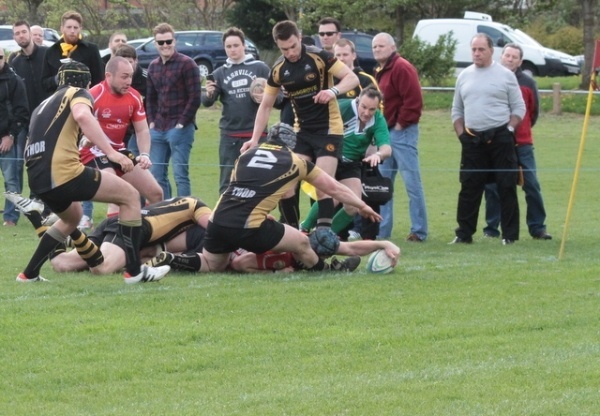 Northwich did finally get themselves on the board though when their captain made a break around the side of the ruck to charge down the field for their first visit into the bolton 22. A last ditch tackle from Doherty stopped the try, but an infringement gave Northwich the chance at 3 which they duly took. Half time came and Bolton knew they had the beating of their opponents if they could continue their impressive defensive efforts. James Brodie came on for Tony McLaughlin who had put in an impressive 40 minutes. But a Bolton error was to cost them dearly as an intercept from the base of the scrum on 45 minutes allowed the pacey Northwich number 7 to race in, much to the delight of the large travelling support. The conversion was missed but Northwich had the lead. After a quiet word under the sticks from Captain Chris Cockton, Bolton charged up the pitch and immediately hit back with a score of their own. A penalty opportunity was put into the corner at the request of Cockton and after Youngman claimed the ball in the air the driving maul was set up. After being illegally broken down and with the advantage in their favour, Ash Cooper put in a characteristic drive and barged over the line for his 11th try of the season. Doherty once again added the extras and at 14-8 Bolton had regained the momentum. Nick Holmes saw this as the opportunity to introduce some more fresh legs into the side with Gaz Pritchard coming on for Alex Youngman. and Pritchard soon found himself involved in the action. Bolton soon gifted Northwich another score with yet another intercept pass. This time from fly half Mike Mills with the visiting number 8 the beneficiary. With the kick under the posts, the score was at 14-15 and all to play for with just over 20 minutes left on the clock. Northwich extended their lead 15 minutes later with a penalty to take the score to 14-18 and leave Bolton needing a try for victory with only 7 minutes left. And Bolton left it down to the wire to sneak victory. Following a line out 5 metres out, Northwich did well to disrupt the Avenue Street men, but it was well tidied up by the forwards who were sniffing blood, Rick Newman took the opportunity to go blind and following a hand off of epic proportions on the Northwich 12 reached out with his left hand to touch down following a call of last play from the match official. Doherty stepped up to add the extras and add some gloss to the scoreline, but the result was already in the bag and Bolton were already celebrating a historic victory. On a personal note, I would like to extend my thanks the fantastic crowd down on the sidelines who cheered us on until the final minute to make the match a true event. Over 500 spectators turned up from both sides to make an incredible atmosphere. What Bolton RUFC has achieved this season is nothing short of spectacular and every player, coach, physio, water boy and supporter has played a part. We now take a break (after the 2 cup finals) and rest the tired bodies before it all starts again in preparation for an incredibly tough 2014/2015 season campaign.